How Long Does it Take to Get Your Pre-Pregnancy Body Back? This is not about postpartum fat loss. This is not about postpartum abs or no abs. These are not postpartum progress photos. They are simply photos of my postpartum body. But, this IS about postpartum bodies. This IS about postpartum bellies. But, it might not be about what you’re thinking it’s about. 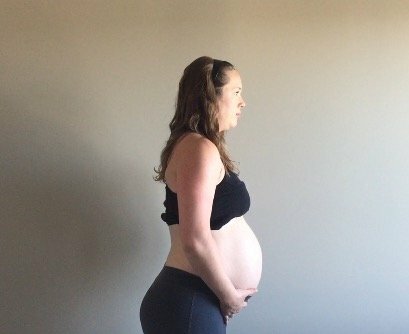 I wanted to show you what my postpartum body naturally did, how it changed just from going through pregnancy to post-pregnancy. 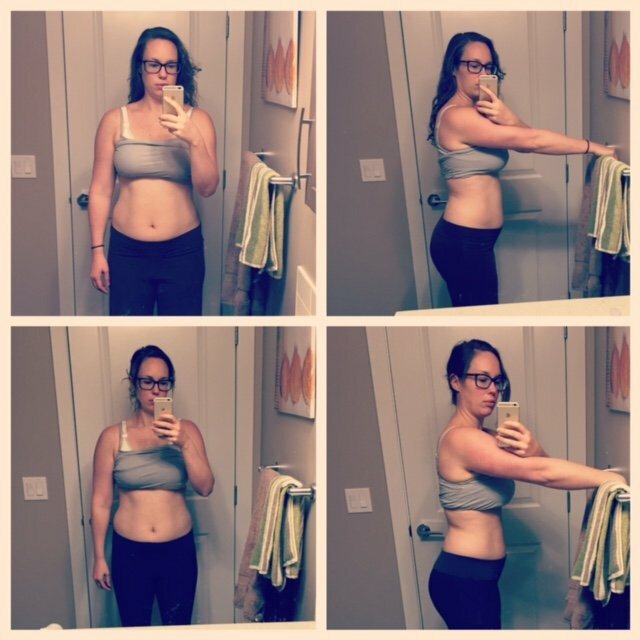 How my body changed without focusing on fat loss for even a minute of the last 12 weeks as a new mama. Progress photos can be misleading. Postpartum progress photos take that to a whole other level. This was the day before I went into labor, August 8th. 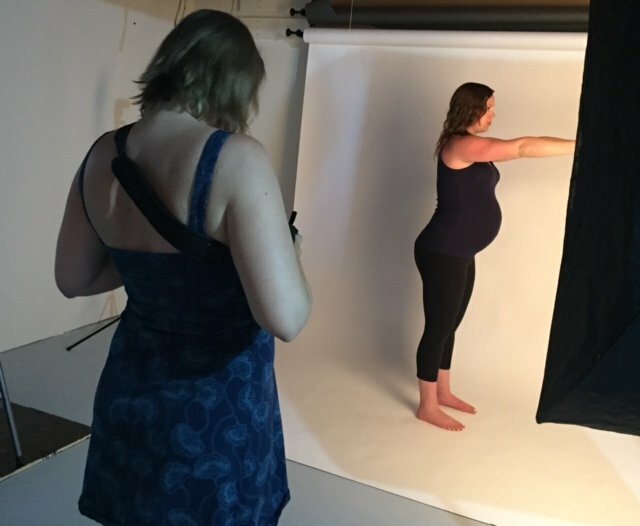 Finishing up the last photos for the Birth Prep program (coming soon! )…at almost 42 weeks pregnant, ha! Forcing it, trying to mould it, depriving it of calories, exercising it into the ground – none of that will “work”. I almost didn’t want to share this blog because I don’t want it to be misconstrued in any way. 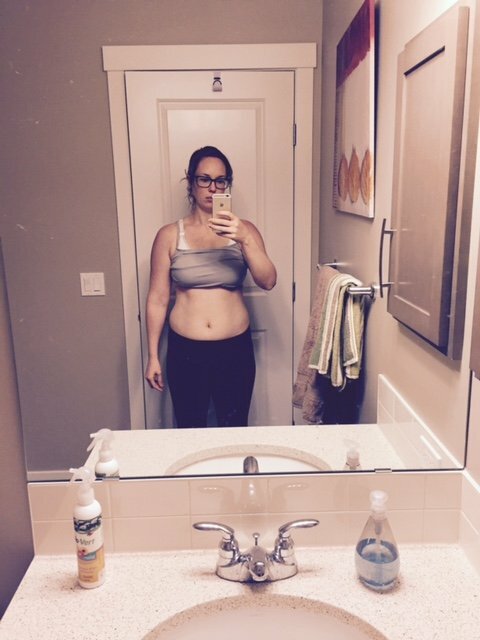 I didn’t take photos of my body after baby to show you how your body can change, how it will go back to “normal” after pregnancy, in hopes of trying to sell you on a postpartum fat loss program. Rather, I wanted to show how a body, my body, changed while I was allowing it to rest and heal. While I was simply trying to take care of my body. While I took care of it during pregnancy with regular exercise, and how I’ve continued to do so postpartum. While I ate, while I didn’t go hungry, while I walked, while I rehabbed my core after C-section, while I started to strength train again so I can feel confident in my body’s abilities. This isn’t about physical appearance progress, but instead about normal SLOW body composition change when I wasn’t focused on body composition change at all…does that make sense? All I’ve done are the basics. I’ve ate food, I’ve moved my body to make myself feel better, and I’ve prioritized sleep. Zzzzzzz. This is what my pregnant belly looked like 6 days before baby Steele was born. So, so cool to look back on. 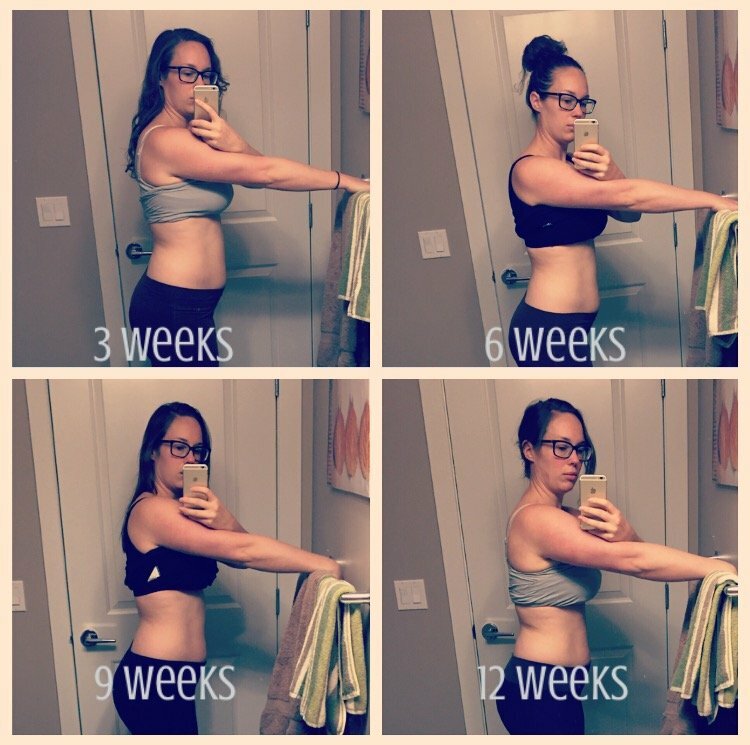 The photos of my belly below are how my belly looked at 3 weeks postpartum, and how it looks at 12 weeks postpartum. For the record, I think it’s a great belly either way. There’s nothing wrong with it at 3 weeks. There’s nothing wrong with it at 12 weeks. There’s nothing that makes me think I’d better get to it and shed some fat now. There’s no problems and nothing to be fixed. I have no idea how much I weigh. I have no idea how much weight I gained in pregnancy, and therefore have no pre-pregnancy weight to return to. 3 weeks postpartum on the top, 12 weeks postpartum on the bottom. 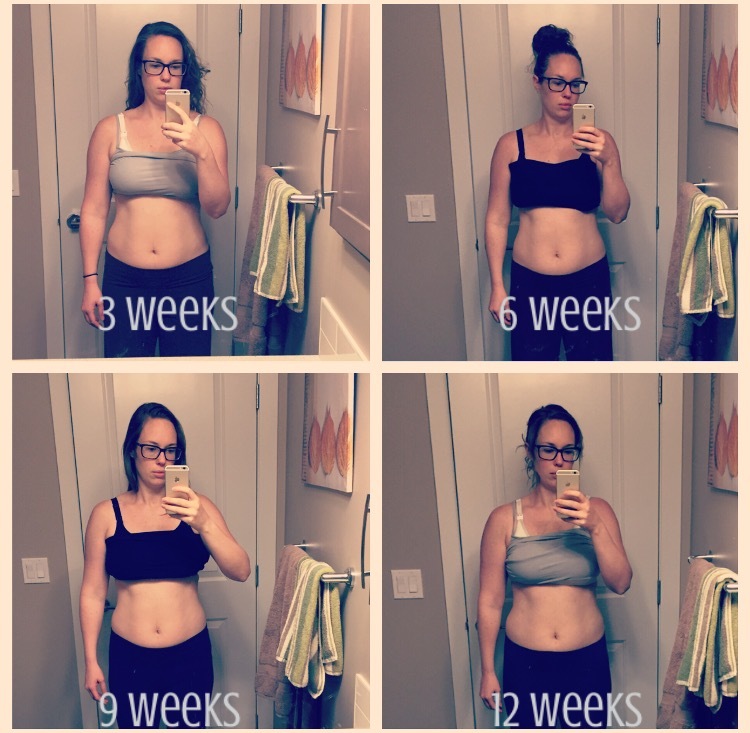 What I think is most incredible about this is how dramatically my body changed over the period of those first few weeks postpartum – just from my body doing it’s thing. My body doesn’t look how it did before pregnancy. I have more body fat now. It’s ok. I don’t have to be leaner. I’m not going to think about limiting my calories or exercising more to lose some body fat. To answer the question of the title: how long does it take to get your pre-pregnancy body back? Maybe I’ll never be as lean as I was before pregnancy. I don’t care. I really don’t. My best guess is that my body will look like this and probably not really change much more until I’m done breastfeeding. And, who knows when that will be? I’m not going to spend the next year wishing and waiting for it to be different, when I can just get on to loving what it is now. 3, 6, 9 and 12 weeks postpartum. I thought this was a cool visual so you can see the slow changes to my body composition over a period of a couple months. Again, I’m not trying to lose fat or change my body composition. I’m simply eating lots of food, strength training 2 days per week, walking daily, and now getting longer chunks of sleep (…I shouldn’t say that out loud, should I?). I hope this resonates with you. My main goal is to show you a “realistic” look at how my body has changed postpartum with the focus solely on being taking care of it. Not hating it. Not focusing on fat loss. You don’t need a million supplements, the tummy slimming wraps, the 6 workouts a week program, the 1200 calories a day meal plan. 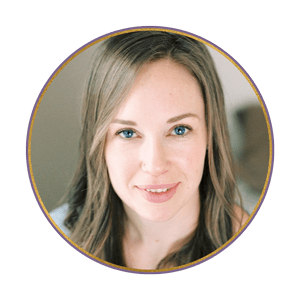 As I told my coaching clients, this is just how it changed from being a “normal mama”.